From 1916 to 1966, Camp Owaissa was a premier camp for girls on the shores of Lake Naomi. Today our Two Bedroom Suite #5 – the “Owaissa Suite” at Mountaintop Lodge at Lake Naomi serves as the perfect base camp for your getaway or family vacation in the Poconos. This comfortable suite consists of two bedrooms separated by a common living area. 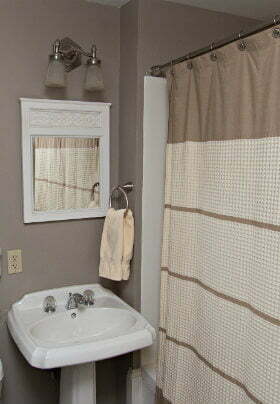 It’s perfect for families or small groups of friends and those guests that enjoy a little extra space. 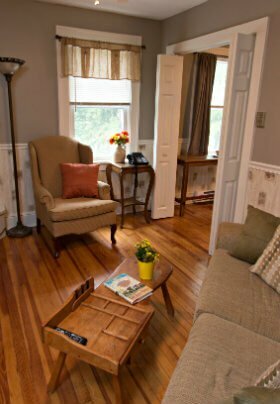 You enter this second-floor suite via the living room, which features original hardwood floors and a window overlooking the front yard. In the corner of the room is a large gas fireplace for those cold winter nights or crisp fall mornings. After a long day of activities, you may want to relax on the full-size pull-out sofa or in the wing chair while watching a movie from our DVD library on the flat-screen television with DVD player. There is also a dorm-size refrigerator to store snacks and beverages. 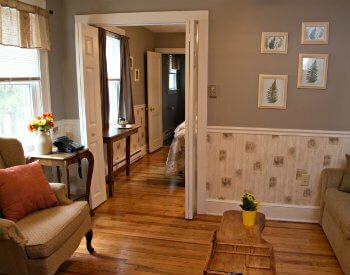 Through the door on your left is the “children’s bedroom,” which is carpeted and features two comfortable twin-size beds and dresser space for storage. There is a single window that overlooks the front yard but, don’t worry, we added a room darkening shade to keep your little ones sleeping past sunrise. On your right are two bi-fold doors that lead to the “adult” bedroom. 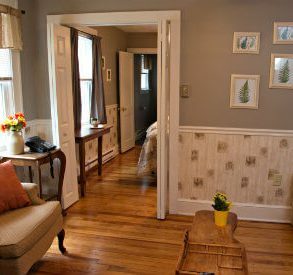 Here you’ll find more of the original hardwood floors, a queen size bed outfitted with Comphy linens, a dresser and spacious closet. This bedroom also features a flat-screen television with DVD player. 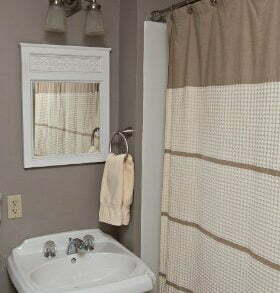 The bathroom is accessed through the “adult” bedroom and offers a deep soaking tub with shower, thick Turkish towels and bamboo lemongrass bath amenities. The Owaissa Suite (Two Bedroom Family Suite #5) can accommodate up to six guests. 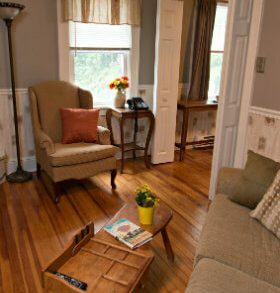 Room rates are based on two guests, additional guests over the age of five are $25.00 per evening.